Background: Soil temperature data is used in soil classification to determine the temperature regime for the soil family class. It is also used to determine the start and end of the growing season for federal wetlands determinations (see definition below). 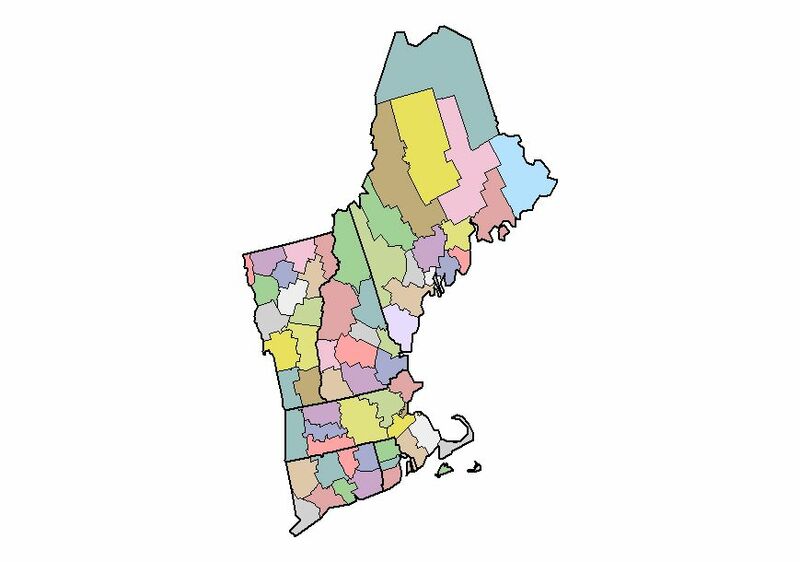 In New England, three soil temperature regimes occur; mesic, frigid, and cryic. Soil temperature is recorded at depth of 50 cm (20 in) for soil taxonomy and/or 30 cm (12 in) below the surface for the regional supplement growing season determination. Growing Season Definition: The 1987 USACOE Wetlands Delineation Manual (http://www.usace.army.mil/public.html#Regulatory) - glossary, Appendix A defines growing season as the portion of the year when soil temperature (measured at 20 inches below the surface) is above biological zero (5C or 41F). This period "can be approximated by the number of frost-free days." Estimated starting and ending dates for growing season are based on 28F air temperature thresholds at a frequency of 5 years in 10. The new regional supplement uses a 30 cm (12 in) depth rather than the 50 cm used in the 1987 wetland delineation manual. Click on a County to link to the WETS Table Text File (not all Counties may have a table, use the adjoining County if not available). 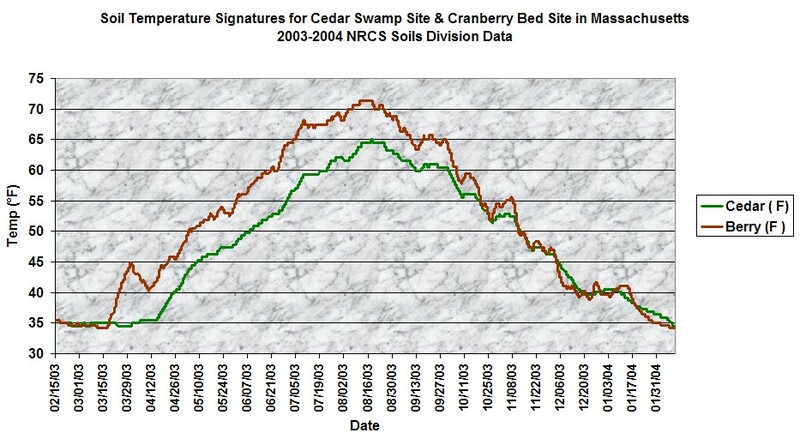 Tables downloaded from: http://www.wcc.nrcs.usda.gov/climate/wetstate.html on March 2003. Site Summary: This site is in the mesic soil temperature regime (Mean Annual Soil Temp. at 20 inches > 46.4 F). The growing season (soil temp at 20 inches is > 40 F) for this site is typically late December through March. Soil temperature readings were taken manually on a bi-monthly period using a wired probe and recorder. 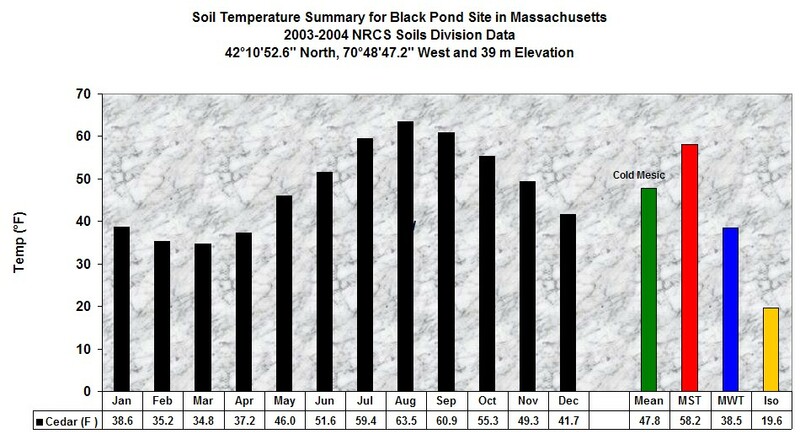 Below: Soil Temperature Data for Mattapoisett Well Site-MA038.3 (Mattapoisett Soil) - units are in Celsius. All soil temperature readings taken from 50 cm (20 in) below the surface. At each site a temperature probe is installed in a wooded area and one in an open area such as a hayfield, lawn, or cropland. In almost all cases the data from the open areas show much more temperature ranges than the wooded areas. From a soil formation point, soils in open area may show more soil development due to the more extreme variations. Summary - The open area is in the mesic soil temperature regime (Mean Annual Soil Temp > 46.4 F), the wooded site in in the frigid temperature regime. Growing seasons (time where soil temp. at 50 cm is above 4F) average from April 15 to December 15. Summary - Both sites are in the mesic soil temperature regime (MAST > 46.4 F). Growing seasons (time where soil temp. at 50 cm is above 4F) average from April 10 to January 15. Summary: Both wooded and open area are in the mesic temperature regime (MAST > 46.4 F). Growing seasons (time where soil temp. at 50 cm is above 4F) average from April 10 to December 10. Summary: Both sites are in the mesic soil temperature regime (MAST > 46.4 F). Growing seasons (time where soil temp. at 50 cm is above 4F) average from April 15 to December 20. Site Summary: Both wooded and open sites are in the mesic temperature regime (MAST > 46.4 F). Growing seasons (time where soil temp. at 50 cm is above 4F) average from April 10 to December 20. Soil temperature data loggers were installed at a depth of 20 inches (50 cm) below the surface in two deep organic soils (Freetown Series, click here for soil information). One site, called "Cedar" is an Atlantic White Cedar swamp located in Norwell Massachusetts (42.18124942 N, -70.81301707 W), the other site called "Berry" is a cranberry bed in the town of Wareham, Massachusetts 41.76790082N -70.66891745W (State Bog 19, Cranberry Experiment Station). 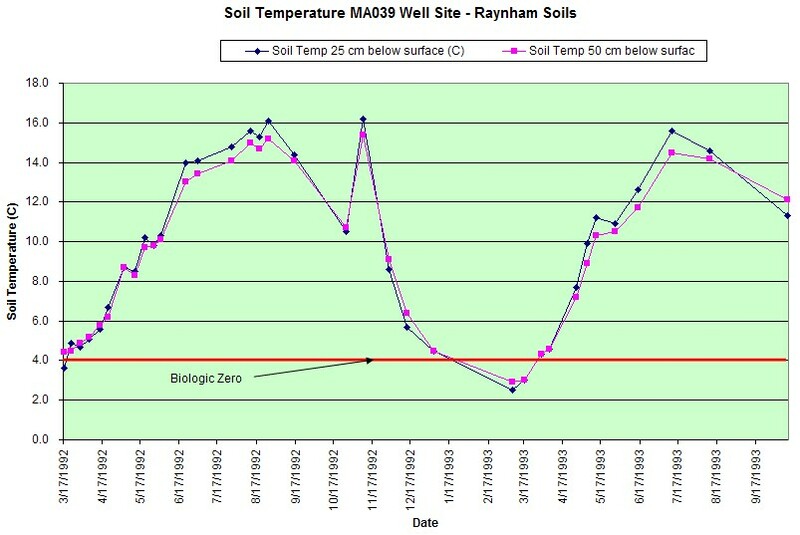 Soil temperature readings were recorded every 5 hours for one year, below is a graphical summary of the study site. Cedar Site had a MAST = 47.8F (cold mesic, borderline frigid), the growing season started in early April through late December. Berry Site had a MAST = 51.4F, growing season were the same as Cedar site. NOTE: This is only 1 year of data! Below - monthly summary of Cedar Swamp soil temperature readings.